Full fat soft cheese made from pasteurised cow's milk. Président Brie is a soft cow's milk cheese with a mild edible rind, famously known as the "King of Cheese" in France. 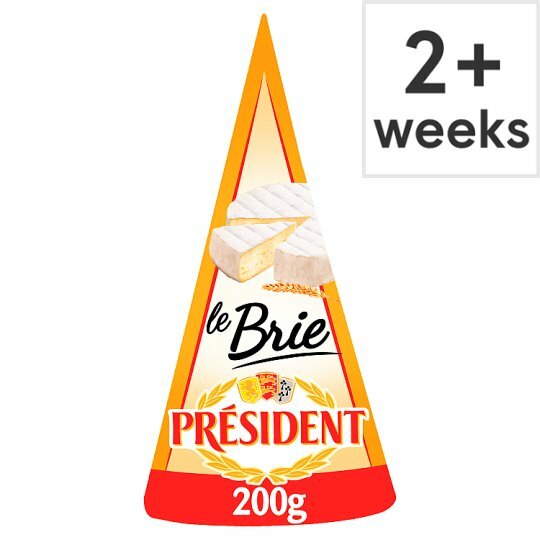 Each wedge of our Président Brie has a buttery smooth texture and a delicate creamy taste. Perfect for a royally good Cheeseboard. At Président, we think life's greatest pleasures are also the simple things. Leave our Brie at room temperature to soften before devouring with warm, crusty bread. Made with pasteurised cow's milk. Not suitable for vegetarians. Keep refrigerated., Use by: see back of pack.